Continuing Care Retirement Community, Your Choices, Our Priorities. Continuing Care Retirement Community. Your Choices. Our Priorities. Continuing Care Retirement Community (CCRC) living at Heather Glen allows you to live independently while also receiving personalized attention regarding health matters and daily routine needs. As part of Ardenwoods CCRC, Heather Glen is an active 48-residence community with services that include round-the-clock assistance with bathing, grooming and dressing, and medication maintenance. Heather Glen’s Health Services team is led by professional care-givers. On board is a registered nurse who partners with physicians, residents, and families for a truly customized approach to short or long-term care. Our comfortable, supportive community also provides a vibrant schedule of social, cultural, and recreational programs. 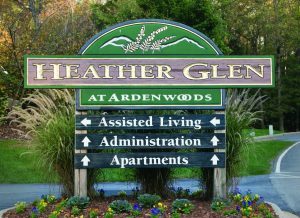 Heather Glen Assisted Living is located on the wooded, 48-acre campus of Ardenwoods, just 15 minutes from Asheville and Hendersonville, NC.